Displaced people, who fled from their homes, are seen at Hamam al-Alil camp south of Mosul, Iraq, July 13, 2017. The United Nations envoy for Iraq says he is concerned about the rise of revenge attacks in Mosul against civilians believed to be linked to Islamic State militants following the liberation of the city. Jan Kubis told the U.N. Security Council Monday that there is a “rising popular sentiment in favor of collective punishment of families perceived to be associated” with IS. 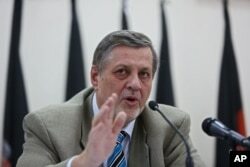 Kubis urged Iraqi Prime Minister Haider al-Abadi to take “urgent steps” to stop the attacks, saying that actions taken against civilians without sufficient evidence violate Iraq's constitution and obligations under international law. Jan Kubis, United Nation representative for Afghanistan speaks, during a press conference in Kabul, July 13, 2014. He said all evidence of crimes committed by Islamic State militants must be preserved to support possible prosecutions. The envoy also warned the Security Council that the future in Mosul is “extremely challenging” and said the government will need to do a lot of work to turn its military victory in the city into stability. He stressed that securing the rule of law and promoting development will be essential. Kubis also spoke about plans by the Kurdistan region of Iraq to hold a referendum on independence in September and urged both sides to quickly start negotiations. He said the talks should address sharing oil and revenue as well as the status of disputed territories. Iraqi forces, along with their coalition allies, recaptured Mosul from Islamic State militants recently following a nine-month military campaign. Islamic State militants had held Mosul, Iraq's second largest city, since June 2014. The fighting led to the deaths of thousands of civilians and caused more than 900,000 people to flee their homes. Much of Mosul's Old City has been destroyed and vast swaths of the city and the surrounding towns and villages have been abandoned.